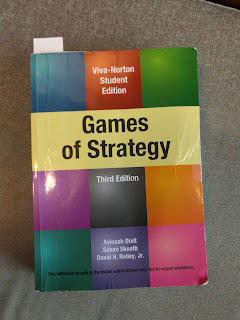 The esteemed Aaron and Austin of Dr. Wictz fame started a Colloquium with Paul Owens as they read through college text book "Games of Strategy" by Dixit (no relation to the board game), Skeath, and Reiley. I have always found Aaron and Austin to be smart engaging people and I love the word Colloquium but I didn't want to listen to their take before reading along. On the internet I picked up a copy of the 3rd edition, because the current version is priced as if the only people who would consider buying it are the rich parents of Ivy League students. I'm through chapters 1 and 2 now so I went back and listened to the Colloquium part 1 which covers the same ground. Then read Mr. Owen's Notes on Games of Strategy -- an addendum to a colloquium? So now I'll talk about my thoughts relating to solo games, signals, screening, and my nomination for the most meta textbook section title ever. Some time in the future I'll read chapter 3 and talk about that. Is a Solo Game a Game? Early in their discussion Aaron, Austin, and Paul discuss the book's particular definition of a strategic game. First, that for a game to be strategic, it can not be purely skill based (a 40-yard-dash) or completely luck based (Russian roulette). They also suggest that a strategic game requires two or more contestants that are mutually aware that their choices impact each other. Aaron, Austin, and Paul suggest that the particular style of Euro games described as multi-player solitaire may not qualify as games under this definition. Paul in his blog post suggests Black-Jack as a non-game under this definition as well. All because each player's actions are made without regard for their opponents actions. Maybe because I've spent some time recently thinking and working with solo rules for Championship Formula Racing, I immediately wondered if a solo game of CFR is not a game. Is any board game I play solo a game? If we take the book's definition literally, the answer is no. In fact, many co-operative games may not be games either. But if we treat the AI at the core of the game as if it were a person, does that change the answer? Does the AI use other player decisions as inputs for its decisions? For CFR the AI's decisions are made independent of what decisions other drivers have or may make. So it may not be a game at that point... it might be a puzzle. I feel like that might be true of many solo (and co-operative) games. However, I could see how games could have AIs that take player actions into account. I would not be shocked if it has not already been done. More importantly, how could I add that to the AI in CFR or other games I might design? If it feels like the AI is taking my decisions into account, does it matter if it isn't? If I think the AI is using my decisions to inform its decisions I think I am playing a game. That feeling is not actually dependent on the reality of how the AI works. This may not happen a lot in board games, but it does with video games. Many video are solo experiences where you feel like you are playing a game as Dixit, Skeath, and Reiley define it. We know there is no human on the other side, but we certainly suspect that our actions and signals change the game's behavior. I have often found myself playing a solo game of Plants vs. Zombies Heroes and completely forgetting I was playing the computer and not another person. I will find myself thinking that they are likely to kill this Zombie because it can be trouble later and that's what other players often do. Then I remember that I'm not playing a person. I am playing an AI that may or may not be taking my play into account for its decisions. This is another really interesting concept that was touched on in chapter 2 of the book and discussed at length in the colloquium and also Paul's blog post. It can also be a hard concept to grasp. These concepts were raised in the book in the context of games with imperfect information. A signal is defined as a decision that credibly reveals information you have and your opponent does not. Screening, on the other hand, is a decision that is made in an attempt to force your opponent to make a signal. Signals seem a relatively easy concept although you can hear Aaron, Austin, and Paul struggle a little with credibility and bluffing and how they relate to signals. Screening sounds straight forward until you try to give examples. Scotland Yard was brought up in the colloquium as a great example of a game with imperfect information. In that game, a signal as Mr. X might be to play a metro token. It clearly signals that I am on one of a limited number of spaces. Taken together with previous signals, it signal gets even clearer. On the other hand, moving an investigator towards one of those metro spaces might be screening -- an attempt to force Mr. X into further signalling such as the use of a x2 token to escape near capture. In Championship Formula Racing certain car builds signal certain strategies. A 100 start speed probably means that I am trying to race from the front. It may not, but it probably does. In most collectible card games, certain cards signal certain deck types. In Plants vs. Zombies Heroes, playing a Headstone Carver signals that I am playing a lot of other gravestone zombies. Do signals have to be true? I think there is a difference between true and credible and wonder if there is a continuum that signals exist on where bluffing may be on one end. Is there a point on this continuum where the action stops being a signal? How awesome that continuum and colloquium are both words in this sentence? I suspect these concepts will be investigated more later. We'll not the one about continuum and colloquium. Coming up with good examples of screening that are not parts of hidden movements games seems really hard. Sure, hidden movement may be one of the more common and more extreme imperfect information game types right now. But many, many games have at least some imperfect information. Lots of games have hidden personal objectives or hands of at least relatively unknown cards. This feels like open design space. Section 3 of chapter 1 is titled "Our Strategy for Studying Games of Strategy"
Chris Long will continue his fine stewardship of this event and has picked the tracks that will be used for qualifying and the finals. 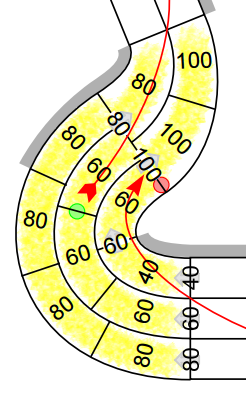 For the qualifying heats, the number of tracks actually used will depend on how many driver participate in that round, so it is possible that not all tracks will be used. The last 3 corners of Sochi... a WBC champion will cross that finish line. Last month I told the tale of how Chris Long would have won the first ever CFR Organized Play championship, if that had been a thing in 2016. In comic book parlance 2016 was like season 0. 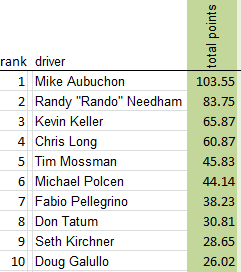 Now we'll talk about how Mike Aubuchon won season -1 and how Randy Needham became the bridesmaid of CFR. 2015 was a bit of a down year for CFR. My PBeM was running again but I was struggling with its growth and it would not finish until the 2016 season. So the 2015 season consisted of 7 races spread over two tournaments: WBC and Redscape's inaugural season. Michael Polcen won that 1st season of Redscape with a 1st, 2nd, and 4th place finish over three races. But this Redscape season was just a hint at what it has become. With only 13 drivers total contesting the season, the field ratings for each race were 0.58, 0.97, and 0.72. The entire series had a field rating of 0.42. So while the top 4 from that series -- Michael, Fabio, Rando, Chris -- do appear in the top 10 for 2015 above, those results only gave them a small head start heading into WBC that year. After 3 heats of qualifying, the finals table at WBC in 2015 included Chris Long, Dennis Nicholson, Don Tatum, Doug Galullo, Jim Fleckenstein, Kevin Keller, Mike Aubuchon, Randy Needham, Robert Kircher, Seth Kircher, and Tim Mossman. The most successful in qualifying had been Randy (1st, 2nd, dnf), Mike (1st, 2nd, 4th), Don (2nd, 3rd, 4th), and Chris (1st, 2nd, 3rd). At this point, Chris probably had the most points of anyone given that he had a 3rd place race finish from Redscape and some points from finishing 4th in that series as well. This WBC finals may have been the most notorious ever because I had picked the long, tight, brutal track at Singapore for the finals. Five cars would not finish this race and I got plenty of hate mail during and after the event for my track choice. In the end, Michael ran an unconventional strategy. On a track that is narrow and hard to pass on, he intentionally started from the back and took advantage of the large number of corners to whittle away the wear on his competitors before just beating out Kevin Keller for the race victory and WBC championship. That one race was worth 60 points to Mike -- 36.94 for the race and 23.15 for the event win -- and would have netted him the Championship Formula Racing Organized Play trophy... if that had been a thing in 2015. And would have been the first of two consecutive seasons in which Rando would finish 2nd in the final rankings. I play a 3-lap race of Championship Formula Racing using the the Historical Driver system that allows you to play solo. Results after race 1 on the right. Spoiler alert... I didn't win. But neither did Vettel after leading the vast majority of the race. The stars next to each driver are their rating in my historical driver system. Three-stars are the best. The point system is the system I always use for races, tournaments, and the CFR Organized Play series. Rindt got 0 points because he crashed. This particular race is contested at Yeongam, South Korea. The track had a short run hosting Formula 1 races starting in 2010. Note that I'm using pre-production bits here and some of the drivers and this track are not currently available. But at the time of posting, the base game is available for pre-order. I don't go through a lot of explaining here, but you can learn more about how the historical driver (AI) system in this 2-part video series. I've been playing a lot of Plants vs. Zombies Heroes lately and have really come to appreciate the asymmetry Electronic Arts designed into their free-to-play CCG -- elements that could certainly be borrowed for physical game design. In case you've never played... PvZ Heroes has some pretty standard CCG elements to it: 40 card decks, cards arranged into classes, power for playing cards increases by 1 every turn, 20 life, race to kill your opponent. While deck construction provides all CCGs with some built in asymmetry, PvZ Heroes adds layers to that by making your opponent play with completely different cards in a completely different way. So the zombie player has to commit their troops first -- generally a disadvantage. Also, they are limited to only creatures in this first phase, no tricks. So they have to think through their card interactions. They can't play a trick and then a creature. They have to remember to save some brains (zombie power) for the tricks phase if they think they need it. Plants get to play any of their cards in any order during their phase. They get to see and react to where the zombie forces are. But they have to wary of that zombie trick phase. How many brains has the zombie saved for their tricks phase. Does that telegraph a play or did they just run out of stuff to do. This asymmetric turn structure is reinforced by the kinds of cards each faction has. Zombie creatures tend not to affect other creatures or the opponent when they are first played. Most zombie cards that affect other creatures or players are tricks. When a zombie player puts a creature on the board, they often have to sweat out the plant phase before they can buff it. That buff they hoped to play in the tricks phase may not have a target by then. Or the plant they were hoping to remove from play in the tricks phase may get buffed out of range of the zombie removal. On the other hand, if a zombie player is out of brains the plant player can play a creature they can't buff until next turn. Knowing that the zombie player has few options in the first phase for creature removal. On the other hand, when a zombie player has brains left for tricks, nothing done in the plants phase is safe. While the zombie player knows that they will have the last chance to change the board state before combat every turn. Of course, there are exceptions and the exceptions can be very interesting. There are Zombie tricks that summon creatures (but not a lot). And then there are gravestone Zombies. 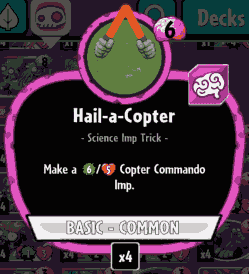 The Hail-a-Copter trick can summon a particularly large zombie (admittedly the trick is expensive to play). 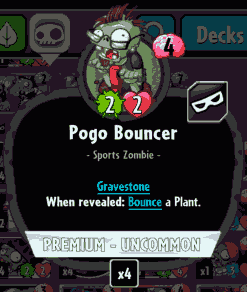 By being able to play it in the tricks phase, the zombie player may be able to be more tactical about its placement knowing the plant player can not respond until next turn. A gravestone zombie is hidden in a "gravestone" when it is played. The plant player does not know what it is and can only affect it with a small number of cards. Also, the amount of brains spent on that creature is hidden. So the plant player is left guessing as to what the zombie player did. When the tricks phase starts, all gravestones are revealed in order (left to right). A good number of gravestone zombies have affects that trigger when they are revealed. For me, these exceptions play into the whole structure of the game. These cards interact with the asymmetry in different ways than a traditional CCG. Another thing I like about PvZ's asymmetric turns is the unique way its deals with the first player advantage. Magic was forced to tack on rules to try to deal with first player advantage. Hearthstone built in the coin idea but both are simply add-ons. I don't even think about first player advantage in PvZ Heroes. Zombies always go first. 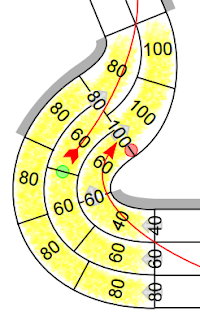 But in the context of the turn structure, I'm not sure how much that matters. This is a level of asymmetry that you usually see in a complex dungeon crawl or hidden movement game. Among CCGs, this reminds me more of NetRunner than anything else. I can't help but wonder how creative asymmetry can be used in board game design. It feels like an area of fruitful exploration. While not intended as a review, I will close by saying that I do recommend Plants vs. Zombies Heroes. In addition to my thoughts on the core game design, it works well and does not fall into the pay-to-win trap that hurts many free-to-play games. I have not spent any money yet and am still enjoying the game. Don went on a tear at PrezCon last weekend. He won the last 3 races of the tournament including the finals. 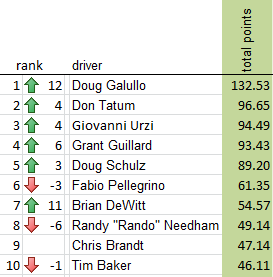 Those results moved Don up 3 spots from 5th to 2nd in the race for CFR OP's first champion. But Doug G still leads the pack by a good bit. Partially because he picked up some points as well over the weekend, but mostly because his 2 race wins and tournament victory came against larger fields and he got more points for them than Don did at PrezCon. The PBeM series Doug won included 50 competitors and his races always had 10 cars. PrezCon was contested by 13 drivers total and races averaged 7 competitors. Brian DeWitt moved up from 45th to 7th after PrezCon on the strength of 4 podium finishes at the tournament. Chris Brandt moved from 56th to 9th after 3 podiums including 2nd in the finals. This will likely be the last big change to the rankings for a while. The Redscape PBeM tournament is promising to net some huge points after it has completed but there is 1 race and likely 2-3 months left before that happens. Interestingly, neither Doug G nor Don are in contention for the championship of that series so the results will likely catapult some other driver into contention. Among the current top 11, Giovanni, myself, Fabio, Randy, Tim, and Michael Polcen are in the top series of that PBeM. The season is scheduled to conclude after the WBC tournament at the end of July. But there could be more one-off races and maybe a small tournament or two in the works between now and then. Remember that if you want to host an Organized Play event, email me at least a month prior.